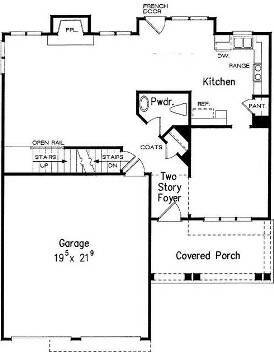 The garage problem is primarily a garage layout problem. The problem originates because of the garage layout in relationship to the house and site. Therefore the solution should be a layout solution. That said, this is a little like tilting at windmills. It will bring some people a few laughs, but the windmill will still stand. The suburban lot is too narrow to hold both a modern house and a modern garage. Both have grown large, but the lots have not. Most builders have their architects solve the problem by putting the garage out front. This minimizes the amount of driveway they need, and keeps the backyards uncluttered. Take a look at these drawings that I pulled from some stock plans. The garage is projecting out from the house, toward the street. This is a typical situation. Since they are attached, a garage layout solution will necessarily involve a house layout solution. 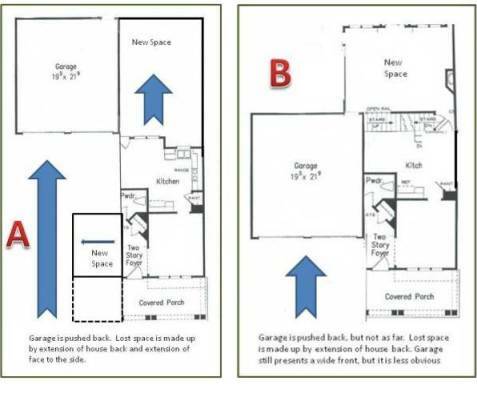 By a layout solution I mean changing the location of the garage so it is no longer dominating the house. It is not an easy problem to solve. It involves some compromises that are their own challenges. If you move the garage back, so that the house is out front, you create an access problem. The driveway needs to feed the garage, which means you either make a very narrow house, create a narrow driveway to get past the house, or create a drive path through the house. Let us take the narrow driveway first. This is the easiest solution. It is a return to past practices. I used to live in Tulsa, Oklahoma and a lot of houses in older neighborhoods had this solution. A one-lane drive squeezed past the house to a detached garage in the back. This is still a viable solution. This may require changing some setback restrictions or getting waivers. It is the law of unintended consequences, but in protecting a green strip around the houses, zoning laws have added to the ugly garage problem. Now I will try to indent the garage and see what effect this has on the house. I have to shift the house around to accommodate the garage. While there are many ways to do this, they all create difficulties. I either make a house with a narrow front, or I have to partially obstruct the garage. Consider my alteration “A” of the original drawing presented. I have moved the garage back almost the length of the house. This is so I can broaden the front of the house. I can’t go all the way across with the house because I have to leave room for at least one lane of driveway. I also can’t have my extension very deep because I need to allow the drive way to get wide again for entry into the garage. The house is now considerably longer, but the house does present a nice face to the street. I have also made a second variation to the garage layout, “B”. This has the garage pushed back, but it is just as broad. It will still look like a wide garage, but since the house will be forward you will notice the house first. The house may still seem narrow and this illustrates the trade off. Ease of access to the garage forces the house to have a narrow front. Finally, we can consider the drive-through option. Generally it is not a very good option and may be just as ugly as the forward-facing garage. It will tend to work better with modernist architecture, where it won’t seem so strange. If you have an opening for a car to drive through it creates a large hole in the house, which can seem just as disconcerting as a large garage door. You could also cantilever the second floor over a driveway, but if it is more than a few feet it will look very odd. What is your garage story, idea, complaint, or advice? Do you any suggestions for solving the garage problem? How about some pictures of a great garage redo? Maybe you have a garage atrocity to report?